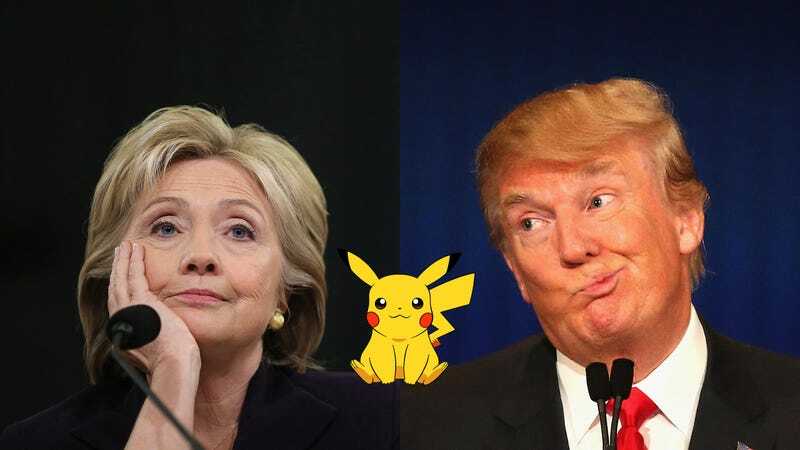 Donald Trump and Hillary Clinton have finally broken their silence on Pokémon Go. Their statements today are about what you’d expect. It’s worth noting that players cannot actually battle one another per se, and while the Ingress map shows two potential in-game locations in Madison Park, Gizmodo has yet to confirm if either is in fact a gym. Trump meanwhile has told the Washington Examiner that he doesn’t have time for Pokémon Go. “I wish I had time,” he told the paper. It’s unclear whether Hillary Clinton plays the game. It’s also unclear whether anyone will care in a week’s time. Update July 14, 5:02pm: Trump’s official Facebook page posted a video approximately 20 minutes ago which is an apparent parody of the game called Crooked Hillary No. Get it? Because he calls her that thing and “no” rhymes with oh dear god this is exhausting already. A trainer captures the Democratic hopeful, who of course has a Combat Power of 1, and her type as “Career Politician” (apparently a bad thing), her next evolution as “Unemployed,” and an entirely new state of “Leaked emails” at 30,000. While that’s an exceptionally high number for any monster stat it’s unclear what effect, if any, it has during actual battle.